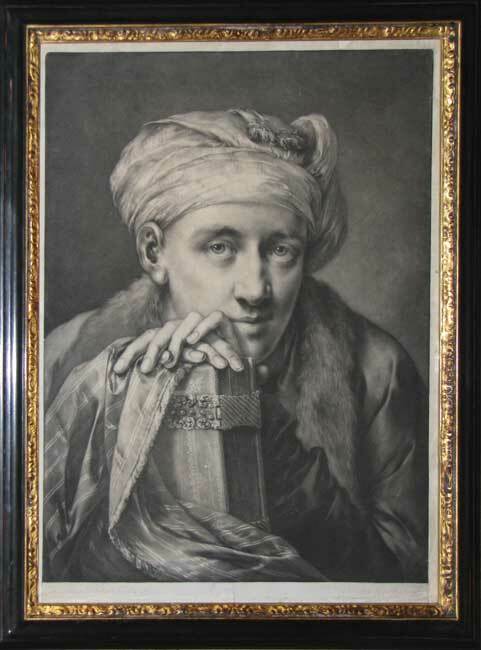 Mezzotint portrait by Thomas Frye published in London, 1760. Thomas Frye was born in Dublin in 1710 but went to London when he was a young man and began to engrave in mezzotint. He became involved in a project for introducing the art of making china in England and took over the management of a factory in Bow. The clay was imported from Carolina at great expense and although some very fine work was produced the scheme was not profitable and Frye's health deteriorated. He went to Wales to convalesce and painted portraits to raise money. Upon his return to London he resumed the art of portraiture and even frequented the Playhouse so that he could obtain a likeness of King George and his new queen; it was even said that they looked towards the artist in order that he might perfect their likeness. Unfortunately, being corpulent and prone to gout, Frye died of consumption in 1762. During his time in London he was on good terms with the President of the Royal Academy, Sir Joshua Reynolds, and produced a series of exceptional portraits. One of his pupils, William Pether, went on to engrave in a very similar style and in all probability completed some of Frye's prints after his death.